The sad tale of “pension reform” — less politely put, the construction of a pipeline from the public treasury to Wall Street — provides a unique, panoramic view of Democratic Party corruption through the tiny keyhole of every public sector employee’s weekly payroll deduction. In Rhode Island, a Democratic-majority state where the old Tammany Hall machine looks like a Catholic grammar school, it is the biggest scandal in history. And surprise, surprise, leading national Democrats have their fingers in the pie. 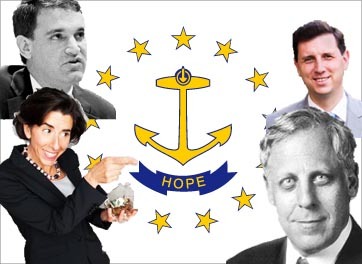 The story begins in the aftermath of the 2008 collapse of the economy when a ne’er-do-well venture capitalist named Gina Raimondo, currently Rhode Island’s governor, won office as state treasurer. Once there, she conned the public into believing that the state pension fund required “reform” and invested piles of retiree money in high-stakes, high-fee hedge funds. 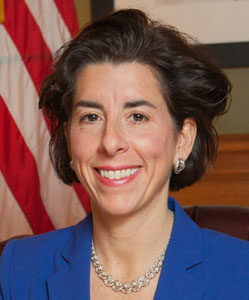 Under Raimondo the state lost $1.4 billion to an investment strategy everyone predicted would fail. Fast forward to 2016 and there has been zero change of direction. 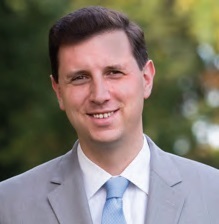 Raimondo’s successor in the Treasury, Seth Magaziner — son of Ira Magaziner, the former Bill Clinton administration senior aide and now a Clinton Foundation crony — passed himself off as a reform candidate with promises to fix bad investments made by Raimondo. He boasted about his own background in the private equity firm Trillium Asset Management, an industrial cousin of hedge funds that likes to say it is more “socially responsible.” But under his watch the fiscal hemorrhaging continues daily. Pensioners have had their Cost-of-Living-Adjustment revoked until the pension returns to 80 percent solvency, something that is impossible given the heavy service fees being charged to the state by hedge fund managers even as they lose money on their dumb investments. The local economy, which would otherwise be given a serious boost by retirees spending cash in their golden years, continues to slump due to weak consumer demand. A bevy of other Democratic Party power players have made important cameo appearances in this ongoing scandal, including Marvin Rosen, a major political fundraiser and longtime pal of the Clintons. Rosen brokered a relationship between Bill Clinton’s administration and Atlantic Richfield Company, which won permission to drill the Alaskan Arctic National Wildlife Refuge. Rosen’s firm earned millions from New York pension fund deals in the mid-2000s and was involved in a pay-to-play controversy related to the New Mexico state pension. Under Raimondo, his firm, Diamond Edge Capital Partners, was paid approximately $1 million to invest Rhode Island pension money, according to Ted Siedle of Benchmark Financial. Perhaps it’s worth mentioning here that the aggregate value of America’s public sector defined-benefit pensions are valued at around $4 trillion? The good folks at AFSCME have made a video that is simply amazing illustration of the “reform” con. The Democratic Party, the traditional party of organized labor and the middle class, has become the vanguard of a predatory financial industry that has already pillaged countries like Greece and Spain. The Raimondo/Magaziner pension heist is part of a greater pattern that tells us one thing: We’re next. Jew Bait: Is Anti-Semitism a Real Threat in American Politics?